Ms. Izadpanah is a graduate of the University of California at Davis, where she received a Bachelor of Arts degree in International Relations and a minor in Spanish. She holds a law degree from the University of San Francisco School of Law, where she focused her studies on international law and public interest law. During law school, Ms. Izadpanah was a member of the Maritime Law Journal and an advocate at the Human Rights Clinic. Through this program, Ms. Izadpanah participated in the Commission on Human Rights Conference at the United Nations with the Human Rights Advocates (HRA) in Geneva, Switzerland in 2003, where she presented a paper on the Juvenile Death Penalty which is still practiced in many nations including Iran. Ms. Izadpanah, through HRA, was involved in closed-table discussion groups with members of countries still in practice of juvenile death penalties in order to assist in the change of their laws. After law school, Ms. Izadpanah focused her career on immigration law, specifically in the areas of deportation defense, asylum law, family immigration, business immigration, and criminal immigration matters. She is a member of the California State Bar, Ninth Circuit Court of Appeals, and Federal District Court. She is also an active member in American Immigration Lawyers Association, IABA, Iranian American Lawyer’s Association, and the San Francisco Bar Association. She is also a member of the Public Affairs Alliance of Iranian Americans and the Pars Equality Center. 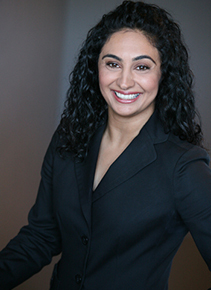 Ms. Izadpanah took a hiatus from immigration law for one and half years in order to broaden her legal horizons in providing Corporate Law, Contract Law, and Employment Law services specifically catered to doctors and dentists at Dental Medical Counsel, PC. Ms. Izadpanah then returned to the immigration field to continue her efforts in providing legal services to the immigration community. Ms. Izadpanah also provides pro bono services through the Lawyer’s Committee of Civil Rights, the San Francisco Bar Association, Immigration Legal Resource Center, Arab Cultural and Community Center, and has provided assistance and an immigration clinic through the Pars Equality Center.